I first learned about Kimberly Stuart several years ago from another blogger talking about Stuart’s blog and how funny and relatable she was. Stuart, who lives in Des Moines, wrote about motherhood and life in a way that I could relate to. While reading, I noticed she was also an author. Over time, I grabbed a couple of her books when they were on a Kindle deal. But, since I don’t always have time to read books that aren’t on my to-review stack, they got buried in my ever-growing ebook list. Then a month ago, I found out my sister-in-law was going to be on a panel with other Christian women in Des Moines and I noticed that one of the women was Kimberly Stuart. I recognized the name and checked out her blog again. A couple days later I surprisingly received an email asking me to review her latest book and I was thrilled to finally get a chance to read one of her books. Stuart also has another new book, coming out in February titled, SUGAR. Stuart writes from a real-life perspective and weaves her faith throughout…not in an overpowering way, but in a way that many of us converse with others. BETTER TOGETHER is the third in a series about her character Heidi Elliott, but having not read the previous two books in the series, I can confidently say, this book stands alone. I may have missed out on some back stories or history, but I was able to enjoy this book without feeling like I was missing anything. Heidi Elliott is a wife to Jake and a mom to Nora. We meet them as Nora is starting Kindergarten. Heidi is feeling lost and wondering how to spend her days while Nora is at school. 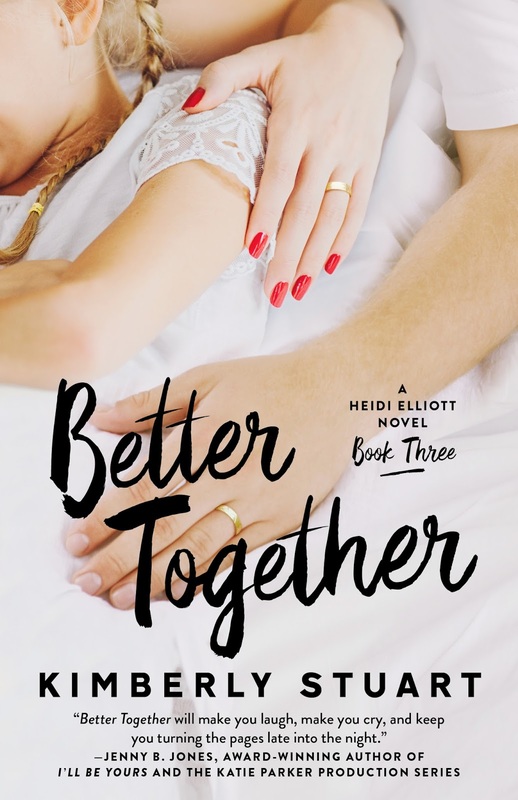 Jake and Heidi have suffered multiple miscarriages since Nora was born and all Heidi wants to do is lose herself in a project at home to forget about that fact that she can’t seem to carry another baby. She paints furniture, organizes and cleans the cabinets, and even tries volunteering in her daughter’s classroom (which was a disaster) but none of it will take away her pain and grief over the loss of the babies. Heidi’s best friend, Willow, has been a constant for her, offering support and laughter when she needed it most but now Willow’s new boyfriend seems to be taking all of her time and Heidi thinks there is something fishy about him. She makes finding out his secrets her new project and it may just cost her everything. Stuart’s witty prose and real-life heartbreak combine for a relatable story that all mothers and women will enjoy. It isn’t easy to write about the pain of losing a child, but reality shows us that life has to move on. Heidi’s struggles are painful to read about yet hopeful as she relies on her faith, her daughter’s daily prayers, and a hope that there is a baby in their future. Jake and Heidi’s relationship and their commitment to family is a bright spot in a world of dreary winter days and sad news stories. You can’t help but smile through the sadness in the story because you know that no matter what happens Heidi, Jake, and Nora will have each other’s back. Kimberly Stuart, in an effort to condone the time and money spent, would like you to know she holds degrees from St. Olaf College and the University of Iowa. She learned lots of interesting things at these fine institutions, none of which prepared her for the lethal cocktail of parenthood and writing. Stuart is the author of five published novels, including the Heidi Elliott series, Act Two, Stretch Marks, Operation Bonnet and a sixth, Sugar, set to release February 2017. She is a frequent public speaker and is passionate about helping others live great stories. To see all of Kimberly Stuart’s books, click HERE. You can also check out her website, HERE. Thanks to the publisher for sending an ecopy of this book for the purpose of this review. This review is my honest opinion. If you choose to purchase the book through the above link I may receive a small commission without you having to pay a cent more for your purchase. Thanks for supporting SincerelyStacie.com.